Everyone needs a dinner recipe in their arsenal that can be whipped up quickly, is able to feed a crowd, and makes terrific leftovers. You guys? This baked ziti is it. Making baked ziti at home something you’ll start doing a a few times a month. Maybe every week. Maybe. The only thing that makes this meal better is a big garden salad and a loaf of your favorite crusty bread, either made from scratch OR grabbed in the grocery store’s bakery department. 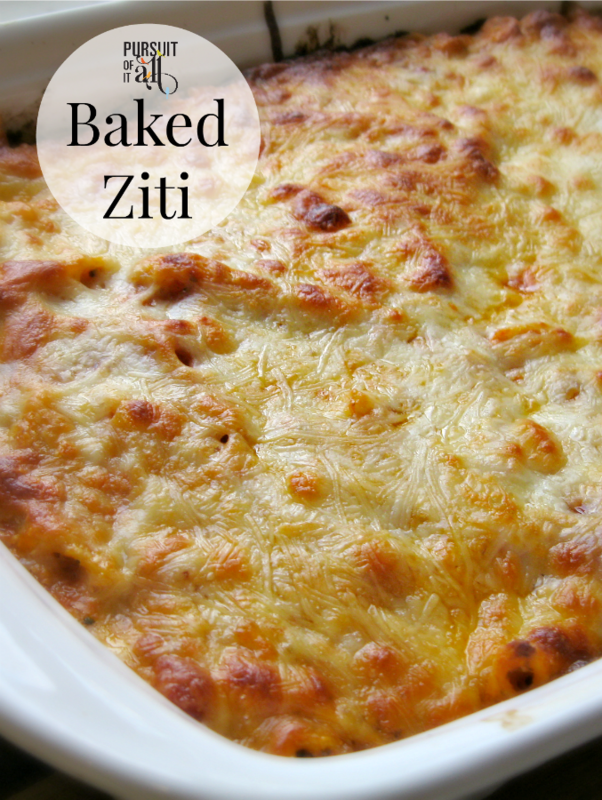 Add this easy baked ziti recipe to your arsenal of quick weeknight meals! Bring water and 2 tablespoons of salt to boil in a large pot. Add the pasta and cook it to al dente. Drain. Mix the marinara, ricotta, ¾ cup mozzarella, ¼ cup Parmesan, ½ teaspoon salt, and the basil together in a large bowl. Add the pasta, stirring gently to coat completely. Coat the bottom of a 9x13" baking dish with olive oil. Spread the pasta mixture evenly in the dish. Sprinkle the top with the remaining mozzarella and Parmesan. Bake for 20 minutes, or until the baked ziti is bubbly and golden brown on top.